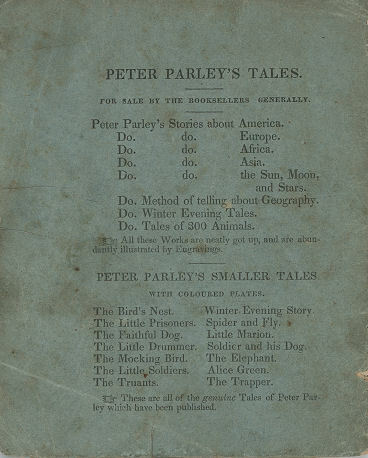 Peter Parley was the most popular adult in antebellum children’s books. An old man with a gouty foot who had been everywhere and knew everything, he loved to tell stories about his adventures to children. Readers loved him and believed he actually existed. In fact, Parley was so popular, he was plagiarized and imitated; finally, Goodrich killed him off in 1839, only to resurrect him a few years later to help “Robert Merry” edit Robert Merry’s Museum. 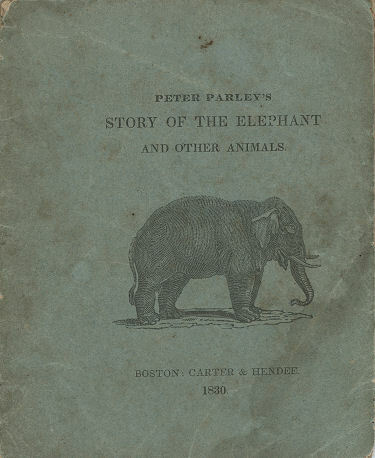 Peter Parley’s Tales of the Elephant was one of a handful of chapbooks published as “Peter Parley’s Smaller Tales.” Unlike Peter Parley’s Story of the Trapper — also in that series—the Elephant was published in Peter Parley’s Winter Evening Tales in 1830. Since it bears the same copyright notice as Winter Evening Tales, which was published first is difficult to discern; the anecdotes are in a different order in each work. 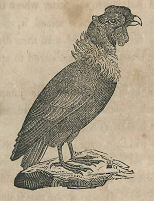 Goodrich seems to have enjoyed raccoons: a raccoon also appears in his The History of Ralph Raymond, published in 1819. While in 1819 Goodrich calls it “not a very interesting animal,” in 1829 he includes the charming and inaccurate information that raccoons fish by using their tails as bait—a bit of rural lore repeated into the twentieth century. 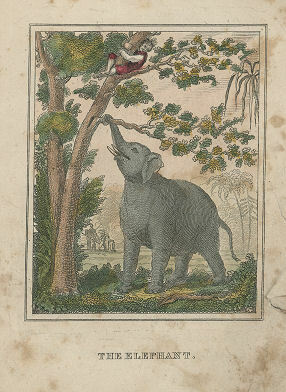 At the beginning of the book is a picture of an Elephant, trying to pull a man off a tree. The Elephant, you know, is the largest of fourfooted beasts. He is found in a wild state in Asia and Africa. He is pursued by the people in those countries, and being taken, he is subdued by harsh treatment, and made to be quite tame and gentle. ascended a tree to escape. The elephant came up and tore off the branches and shook the tree, and would have shaken the man off, if his companions had not come up and driven the elephant away. But when the Elephant is tamed, he becomes very useful. In India the people ride on his back as we do on a horse. Now the elephant is the most intelligent of the brute creation, and there are many curious stories about him. There was once an elephant in London, and as he was going by a tailor’s shop he just popped his trunk, or proboscis, into the window, expecting that the men who were there would give him something to eat. Instead of this, one of the tailors stuck his needle into it, which gave the elephant great pain. Well, the elephant did n’t knock the fellow down, as he might have done, with a stroke of his probiscis, but he went to a dirty puddle, filled his trunk with the water, and went back and squirted it all over the ill mannered tailor. 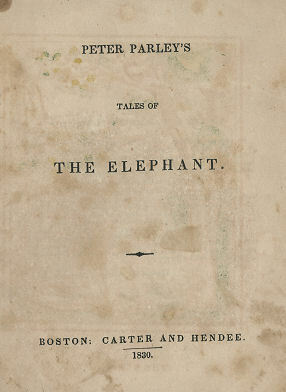 As this is a short story about the Elephant, I will tell you of some other animals. Here is a picture of a Racoon. takes up nuts and other things in his fore paws, as handily as you could with your fingers. He looks them over and over, and seems to be very curious and inquisitive. The racoon has a singular method of catching fish. He will go and set on a stone by the water, and let his tail hang down into it. The fishes see his tail, and think it is something to eat; so one of them opens his mouth and gives it a bite. As soon as the racoon feels the bite, he twitches his tail, and throws the fish out on the shore, and then eats him up. the top of the water, watching for flies. When he saw a fly crawling along on a stone or stick, that projected over the water, he would squirt a little water at him. Being it seems a good marksman, he was sure to hit the fly, who would come tumbling down, and the fish, who was waiting for his prey, would devour him at a single mouthful. In the West Indies there is a very singular fish called a Walking Fish. When the pool or brook where he is, becomes dry, he will set off for another. As he has no legs, he throws himself along by means of his tail, which he first bends, and then straightens it with a jerk. In this way he is said to travel at the rate of three miles an hour. Here is a picture of a Frog. I suppose you have seen frogs often. You would hardly suppose that there could be anything interesting about them, but there is no animal, which, if we carefully observe it and study its habits, does not afford something to excite our curiosity or surprise. they made a great noise. The people of a village near by, heard them, and were astonished and alarmed. They had never heard such sounds before—and were utterly at a loss to guess what it could all mean. There were curious conjectures about it—some said it was one thing and some another, and it was a long time before they found out that it was only the music of frogs. Here is a picture of a White Bear. This animal is found far to the north, in the cold frozen regions of Greenland. He is very large, and is sometimes seen floating in the sea, seated on a cake of ice, for his boat. There was one of these animals in Boston, a short time since, [and] when his keeper told him to show the people how to break ice, he would rise up and strike on the floor very hard with his fore feet. Here is a picture of the Jaguar. The jaguar is found in South America. He is as large as the largest dog; he kills deer, sheep, and other animals, for food. But he has a very curious method of catching fish. He goes to a river and drops his spittle upon the surface of the water. The silly fish come up to see what it is; as soon as they come near enough, the jaguar knocks them out of the water, upon the land, with his paw. He then eats them at his leisure. Over the leaf is a picture of a man on the back of an alligator! Captain Waterton, a very singular Englishman, went to South America a few years ago, and travelled in the woods and wilds of that country. He met with many strange adventures, which he has related in a book. hook and put it into the water where the cayman was. The animal seized it, and was caught by the hook. The men then drew him out of the water, but no one dared to approach him at first. By and by Captain Waterton jumped upon his back, twisted his legs round, and then they beat him to death. If you will turn over the leaf you will see a picture of a Condor, the largest bird of flight that is known. It is as large as a child one or two years old. It is so strong that it can carry off a sheep. It lives in South America, amid the high mountains. It has been known to carry off children. I once heard of a condor that took a little boy into the air, and carried him to his nest, in the mountain, without hurting him. There were some young condors in the nest, and the boy snugged down between them, and pretty soon his father came and rescued him. Here is a picture of a dog with a boy on his back. There are many dogs, you know, that are very wise and sagacious. In Switzerland there is a species of dogs, who have saved the lives of many persons by their sagacity and perseverence. mountains called the Alps, people are often covered up with masses of snow which fall from the rocks and bury them beneath it. Now these dogs will go out in search of poor travellers who may be thus lost, and will dig them out of the snow, and save them. One of these dogs once found a woman in the mountains with a beautiful boy; she was herself already insensible from cold, but she had wrapped up her child so carefully that he was quite warm. The dog got the boy on his back, and carried him to the monastery which was the dog’s home. The people took good care of the child, and then they followed the dog in search of his mother. The sagacious animal led them to the spot, but she was frozen to death.